Al-Nusra Front operatives observing the Shiite village of Nahle from the ridges that dominate it (Al-Nusra Front-affiliated Twitter account, June 21, 2015). nThe Kurdish forces, which took over the city of Tal Abyad near the Turkish border, are working to expand their area of control and force out the ISIS operatives. The takeover of Tal Abyad was a significant failure for ISIS, since foreign fighters and supplies from Turkey used to pass through the city and the nearby border crossing. ISIS also exported fuel products to the black market in Turkey via Tal Abyad. The fall of Tal Abyad has increased ISIS’s logistical dependence on the Jarabulus border crossing in the northern Aleppo province, which is under its control. n In and around the Druze village of Khader, in the northern Syrian Golan Heights, fighting continued between the rebel forces, including the Al-Nusra Front, and the Syrian security forces. According to media reports, the rebels are trying to take over the hills dominating the village and the road leading to it. According to a Hezbollah-affiliated Lebanese newspaper, the road to the village is blocked because of sniper fire, but there is enough food, medicine and ammunition in the village to enable its residents to hold out. nIn eastern Libya, ISIS recently suffered several setbacks after a series of successes in Libya. In the area of the city of Derna, ISIS is under dual pressure by the army of the Libyan government in Tobruk and by a local jihadi organization affiliated with Al-Qaeda. According to Libyan and Arab media reports, most of the ISIS operatives have fled from Derna and several villages and towns in the west and southeast of it. The situation on the ground in Derna and its environs is still unclear. 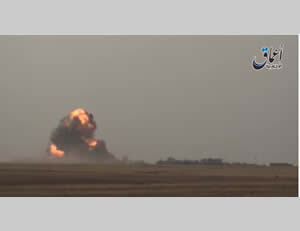 Syria– the airstrikes were concentrated in the areas of Al-Hasakah, Al-Raqqah, Tal Abyad, Deir al-Zor and Aleppo. The airstrikes damaged ISIS tactical units, battle positions, vehicles (including a car bomb), motorcycles, a weapons manufacturing facility, crude oil collection facilities and tunnel entrances. Iraq– the airstrikes were carried out in Al-Qaim, Baiji, Fallujah, Makhmur, Mosul, Ramadi, Sinjar, Tal Afar, Hawija and Al-Baghdadi. The airstrikes damaged ISIS tactical units, checkpoints, storerooms, weapons, bunkers, a rocket launching position, vehicles (including car bombs), heavy machinery, staging areas, buildings, bridges, defensive obstacles, battle positions and a car bomb workshop. According to US Secretary of Defense Ashton Carter, the US will not stop its actions to destroy the terrorist organizations such as ISIS, Al-Qaeda and other terrorist organizations that endanger the US and its allies (US Department of State website, June 17, 2015). According to Secretary of Defense Carter, US efforts to train the Iraqi Army have encountered difficulties due to a lack of recruits. His remarks were made about a week after statements were made by American officials regarding the intention of the US to send more American instructors to Iraq to train the Iraqi Army (see the ITIC’s Information Bulletin “Spotlight on Global Jihad,” June 11-17, 2015). The inconsistencies in statements by American officials could indicate the difficulties that the US is experiencing in its efforts to raise the level of competence of the Iraqi Army. Britain has decided to establish a new unit to rescue archaeological artifacts from ISIS.The unit will be staffed by experts from Britain who will join their colleagues in Iraq, Syria and Libya to identify antiquities that could be rescued from ISIS. They will also document the ancient sites on digital media to enable future generations to see the antiquities and make it possible to reconstruct them. During the summer, there will be a summit meeting on the subject, and the aim is to draft an international convention for the conservation of historical sites during armed conflicts (Daily Mail, June 21, 2015). On June 20, 2015, a number of rebel groups announced the establishment of a new military framework in Daraa and Quneitra by the name of Jaysh al-Fatah, the Southern Region. 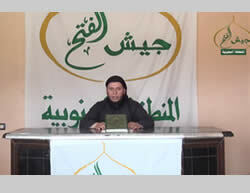 Abu Thabet, a commander of the rebel organization Ahrar al-Sham (one of the components of Jaysh al-Fatah), said that the new framework would include the Al-Nusra Front and other organizations (Al-Jazeera TV, June 20, 2015). Jaysh al-Fatah is the name of a military framework of Islamic organizations in which the Al-Nusra Front is the dominant organization. This framework was established in the Idlib province, northwestern Syria, and has been successful (its forces are threatening Latakia and the coastal areas). Due to its successes, Jaysh al-Fatah has become a type of brand, and attempts to replicate this brand are now being made elsewhere in Syria (for example, in the rural area east of Damascus). In the ITIC’s assessment, if a Jaysh al-Fatah framework establishes itself in southern Syria, the Al-Nusra Front will play a central role in it. During the week, confrontations continued in the Druze village of Khader, in the northern Syrian Golan Heights.According to media reports, the rebel forces, including the Al-Nusra Front, have enjoyed tactical successes. On June 20, 2015, Jaysh al-Fatah in the Southern Region announced that it had managed to take over Tell Younis, which was populated until now by UNDOF forces and is located on the road between Khader and Beit Jinn (SNN Facebook page, June 20, 2015; Al-Arabiya al-Hadath, June 22, 2015). According to other reports, operatives from the Al-Nusra Front, along with other organizations, managed to take over the hills that dominate the route leading to the village of Khader (Al-Mayadeen, June 21, 2015). It was later claimed that the Syrian Army had managed to regain control of the UNDOF outpost and of other hills in the region (Al-Jazeera TV, June 22, 2015). At this stage, the Druze village of Khader has not fallen into the hands of the rebels. According to a Hezbollah-affiliated Lebanese newspaper, the local Druze residents and the Syrian regime’s homeland defense forces continue to hold their own in Khader, preventing the rebel organizations from advancing toward it. The road to the village is reportedly blocked because of sniper fire, but there is enough food, medicine and ammunition in the village to enable it to hold out (Al-Akhbar, June 18, 2015). 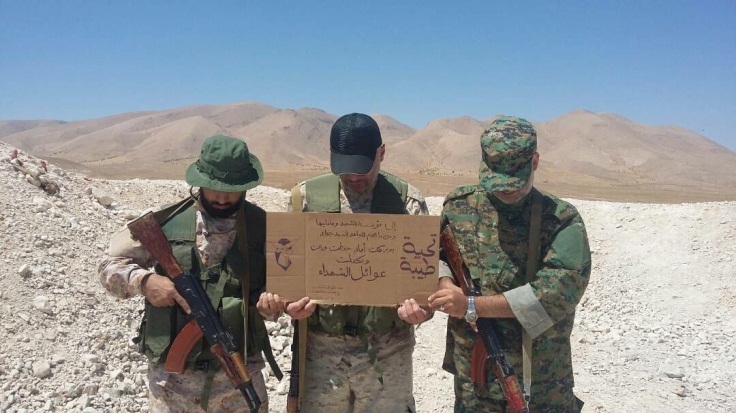 The Free Syrian Army called on the Druze residents of Khader not to cooperate with the forces of the Syrian regime, stressing that there is no intention to involve the villagers of Khader in conflicts directed against the Syrian regime’s forces in the region (Al-Arabiya al-Hadath, June 21, 2015). On June 15, 2015, the Kurdish forces managed to capture the city of Tal Abyad. After the takeover, confrontations continued between the Kurdish forces (YPG) and ISIS operatives in the city. On June 21, 2015, an ISIS operative blew himself up near a checkpoint of the Kurdish forces in the village of Antara, south of Tal Abyad. 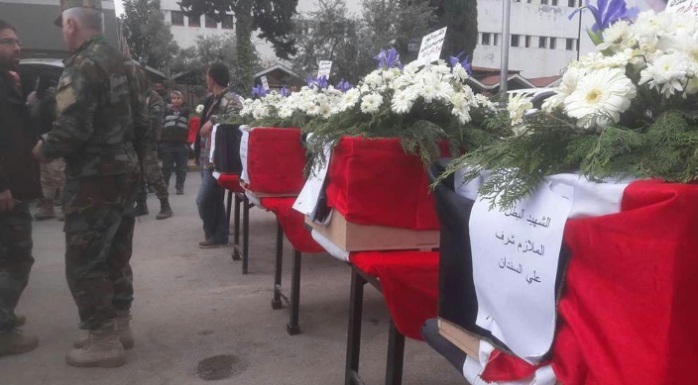 The blast killed a Kurdish fighter and injured three others (syriahr.com, June 22, 2015). After the takeover of the city of Tal Abyad, some of the refugees who had fled to Turkey began returning to their homes. Around 200 refugees, including women and children, have reportedly crossed the border through the border crossing near the city. It was also reported that the city itself had begun to return to normal life. However, most residents of the city and the region are still staying in Turkey (some 23,000 residents have reportedly fled to Turkey) (AFP, June 17, 2015). The Kurdish forces’ takeover of the city of Tal Abyad from the hands of ISIS, with air support from the coalition forces, constitutes a significant failure for ISIS. Foreign fighters and supplies from Turkey to the parts of Syria controlled by ISIS used to pass through Tal Abyad. ISIS’s exports of fuel products from the oil fields under its control to the black market in Turkey also passed through Tal Abyad. The loss of the city cut off ISIS’s main supply line between Al-Raqqah and the Turkish border, and ISIS now has to rely on the Jarabulus border crossing in the northern Aleppo province (west of Ayn al-Arab). The Jarabulus border crossing has been formally closed by the Turkish authorities, but in its vicinity there are a number of routes used by ISIS for crossing the border between Syria and Turkey (AFP, June 17, 2015). On June 19, 2015, an ISIS-affiliated Twitter account published an announcement on behalf of ISIS’s Al-Raqqah province, stating that ISIS operatives hadrepelled an attack by PKK (the Turkish Kurdistan Workers’ Party) operatives in the area south of Kobani. According to the announcement, nine PKK operatives were killed in the incident and a large quantity of booty was seized. 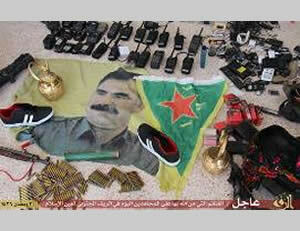 The items seized included a poster bearing the image of Abdullah Öcalan, founder of the PKK, who has been imprisoned in Turkey since 1999, and a YPG pennant (ISIS-affiliated Twitter account, June 19, 2015). The YPG (People’s Protection Units) is the Kurdish military force in Syria that took over Kobani. It now controls the city and its surroundings and is establishing itself in the Al-Hasakah province and the northern Aleppo province. The YPG is affiliated with the Turkish organization PKK. Hence it is possible that the PKK operatives referred to in the statement by ISIS belong to a Kurdish force that came from Turkey to reinforce the YPG forces in the area of Kobani. On June 18, 2015, ISIS issued a video documenting a truck bomb attack carried out by its operatives against the Kurdish forces in Kobani (Aamaq, June 18, 2015). On June 20, 2015, an ISIS-affiliated Twitter account reported that there had been battles between ISIS operatives and forces of the Syrian regime in the vicinity of the Tiyas military airbase (T-4), about 85 km east of Homs (ISIS-affiliated Twitter account, June 20, 2015 ). The Syrian Army, which retreated from the southern neighborhoods of the city of Palmyra, has been deployed at the Tiyas airbase (T-4) east of Homs since late May 2015. ISIS previously tried to take over the Tiyas airbase, but its attempts failed. This is an important airbase, and if ISIS manages to take it over, this could disrupt the Syrian Air Force’s air support for the Syrian Army forces fighting against the rebels. The London-based Syrian Observatory for Human Rights (SOHR) announced that on June 20, 2015, ISIS operatives planted mines and IEDs in the ancient sections of the city of Palmyra, which it has taken over. According to the report, mines and IEDs were planted throughout the ancient city, including around the ancient Roman theater. It is not yet known whether the purpose of this activity is to destroy the antiquities or to prepare to prevent the recapture of the city by the Syrian regime (syriahr.com, June 21, 2015). In the ITIC’s assessment, the possibility that ISIS’s forces are preparing to damage the antiquities in Palmyra, which are of major archaeological importance, must be considered. This week as well, fighting continued in the northern Al-Qalamoun Mountains between Hezbollah and the Syrian Army forces and the Al-Nusra Front and its allies. Along the ridges of the Lebanese town of Arsal, battles continued between Hezbollah and Al-Nusra Front operatives (Lebanon Files, June 19, 2015). On June 21, 2015, Al-Nusra Front-affiliated Twitter account posted photos showing Al-Nusra Front operatives on the ridges dominating the Lebanese Shiite village of Nahle, which has about 8,000 residents (approximately 6.5 km northeast of Baalbek). 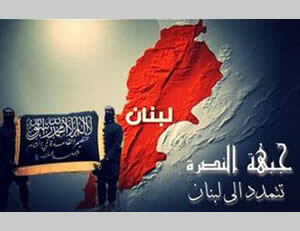 It also posted a propaganda poster showing the Al-Nusra Front flag against the background of a map of Lebanon, with the inscription “The Al-Nusra Front is spreading into Lebanon” (Al-Nusra Front-affiliated Twitter account, June 21, 2015). In the Al-Anbar province, local clashes continued between ISIS and the Iraqi Army, which continues to maintain a presence in several places in the province. On June 19, 2015, the Iraqi Army carried out an airstrike in the city of Hit, which is in the hands of ISIS. The airstrike reportedly killed 19 ISIS operatives (Al-Iraq News Agency, June 19, 2015). ISIS announced that it had carried out a mortar attack against an Iraqi Army base on the outskirts of Habbaniyah (located between Fallujah and Ramadi), an important city that is still under the control of the Iraqi Army in the Al-Anbar province (ISIS-affiliated Twitter account, June 21, 2015). In addition, the Iraqi Army reportedly repelled an attack by ISIS in the city of Al-Baghdadi, as well as another attack against Iraqi Army soldiers south of the city of Fallujah (Al-Jazeera TV, June 20, 2015). The city of Habbaniyah, controlled by the Iraqi Army. It is located between the cities of Fallujah and Ramadi, which are both controlled by ISIS (Google Maps). 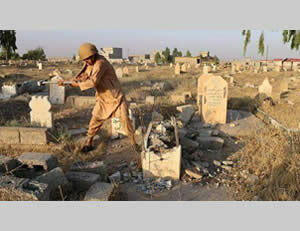 On June 22, 2015, a Twitter account affiliated with opponents of ISIS posted photos under the inscription “ISIS is destroying the graves in Mosul.” The photos show ISIS operatives shattering graves in one of the cemeteries in the area (Twitter account, June 22, 2015). According to Western media reports, Ali Awni al-Harzi, a senior ISIS operative born in Tunisia, was killed in a coalition airstrike in Mosul. Ali Awni al-Harzi is suspected of involvement in the attack on the US Embassy in Libya in September 2012. According to a spokesman for the US Secretary of Defense, Ali Awni al-Harzi had operated together with ISIS operatives in North Africa and then moved to Iraq. According to US officials, Ali Awni al-Harzi was responsible for planning hundreds of suicide bombing attacks around the world and was one of the first foreign fighters who joined ISIS (Daily Mail, June 23, 2015). Two Australian citizens were reportedly killed in a drone attack by the coalition forces in Mosul. The two men, Khaled Sharrouf and Mohammed Elmar, left for Syria in 2013 and stayed in Al-Raqqah. They later went to Iraq and fought alongside ISIS in Mosul. According to the Australian government, the report is still unconfirmed (The Guardian, June 23, 2015). According to a report in The Long War Journal, there are more than one hundred training camps of jihadi organizations in Syria and Iraq. According to the report, not all of these training camps are operative. 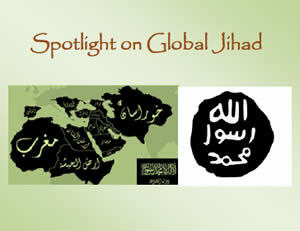 The training camps, mostly run by ISIS and the Al-Nusra Front, pose a regional and global threat. Since the start of 2012, 117 training camps have been identified, 85 in Syria and 32 in Iraq. At least 16 camps have closed. Around 15 to 22 of them have been attacked by the coalition forces and it is unclear whether they have been reopened, whether at the site of the attack or elsewhere (The Long War Journal, June 21, 2015). The Egyptian security forces continued their intensive security operations against the global jihad operatives in the Sinai Peninsula. 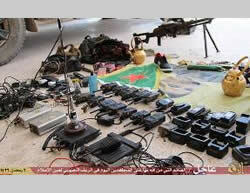 Among other things, the security forces killed Ansar Bayt al-Maqdis operatives, detained additional operatives, detonated IEDs, destroyed terrorist infrastructure and confiscated cars, motorcycles and weapons (Dot Misr, Al-Masry al-Youm, Al-Youm al-Sabea). 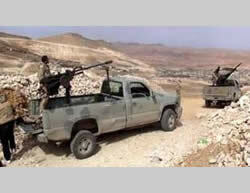 As part of its security activity, the Egyptian security forces cordoned off Al-Arish and prevented entry into the city. This was apparently done in order to catch a squad that was planning to harm Egyptian security personnel (Al-Youm al-Sabea, June 20, 2015; Al-Watan, June 21, 2015). 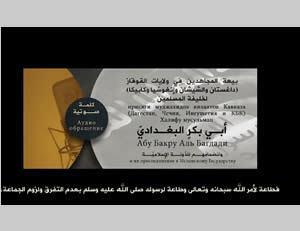 ISIS’s branch in the Sinai Peninsula distributed a video marking the first anniversary of the Islamic Caliphate. One of the speakers in the video says that he hopes that Allah will assist the Islamic Caliphate of ISIS, which is based on the bodies of the jihad fighters who were willing to sacrifice their lives for it. Another speaker addresses ISIS leader Abu Bakr al-Baghdadi: “You have loyal soldiers who are willing to behead infidels and choose victory or the death of a martyr.” The third speaker expresses his gratitude at Allah for allowing him to migrate (perform Hijra) to the Sinai Peninsula, an area where Islamic law (Sharia) is implemented (YouTube, June 18, 2015). An Israeli-Arab family from the city of Sakhnin contacted the Israeli authorities to checkwhether a relative of theirs had left Israel with his wife and three children to join the ranks of ISIS in Syria. According to his relatives, he went to Romania to meet his brother-in-law, who is studying there, and from there he went to Turkey in order to continue to Syria. It is unclear whether the family reached Syria. Searches for them concentrate on Turkey (Haaretz daily, June 22, 2015). A few months ago, Salah al-Din Mahamid, a 23-year-old resident of Umm al-Fahm, went to Turkey with his wife and infant son. From there he crossed the border into Syria and joined ISIS. He initially fought in northern Syria. His present whereabouts are unknown (Haaretz daily, June 22, 2015). To date, scores of Israeli Arabs have traveled to Syria to join jihadi organizations. The phenomenon of Israeli Arabs taking their families with them is relatively new. Foreign fighters traveling to Syria with their families is a familiar phenomenon in Europe and the Arab world. The fact that they go with their families is an indication of their intention to settle in the Islamic State on a long-term basis and not to return to their home countries (like most of the foreign fighters). ISIS’s branch in the city of Derna and its environs has recently been under pressure from the Libyan Army and a jihadist organization affiliated with Al-Qaeda. According to reports, there was an exchange of gunfire in the city of Derna between operatives of the Shura Council of the Jihad Fighters of Derna, which is affiliated with Al-Qaeda, and ISIS operatives. Dozens of ISIS operatives were reportedly killed and the Shura Council operatives managed to take control of the most vital areas of the city (Akhbar Libya, June 19, 2015). The Derna municipality building, the Waqf offices and the court in the city were set on fire by persons unknown, apparently in order to prevent the dissemination of documents proving the involvement of the city’s residents in ISIS’s activity. Most of the ISIS operatives fled the city, some are still hiding there and some surrendered to the Shura Council of Derna (Akhbar Libya, June 20, 2015; Al-Arabiya TV, June 21, 2015). The Libyan Army and the Shura Council of the Jihad Fighters are operating separately to oust ISIS from the area:On June 19, 2015, the Libyan Air Force attacked and destroyed an ISIS aid convoy west of Derna. According to reports, the Libyan Army liberated the town of Ras al-Hilal (around 45 km northwest of Derna), Libyan Army forces managed to take control of the Al-Jabal al-Akhdar coast, located around 65 km northwest of Derna (Akhbar Libya, June 19, 2015). On June 21, 2015, the Libyan government in Tobruk announced that ISIS had failed in its attack on June 19, 2015, which was designed to take over the town of Martuba, located 25 km southeast of Derna. Eleven ISIS operatives were killed in the attack (Al-Jazeera TV, June 21, 2015). n According to an announcement on Twitter by Al-Qaeda in the Islamic Maghreb, a branch of Al-Qaeda, Mokhtar Belmokhtar (Khaled Abdel Abbas) is alive and was not killed in an American airstrike. The announcement accuses the media of spreading lies about his death, in order to justify the US airstrike against “innocent tribesmen in Libya.” The east Libyan government, which is recognized by the international community, announced on June 14, 2015, that Mokhtar Belmokhtar had been killed in an airstrike carried out by the United States. Until recently, there has been no confirmation of the death of Mokhtar Belmokhtar in this airstrike (New York Times, June 16, 2015). A video in Russian shows jihadi operatives from the Caucasus pledging allegiance to the leader of ISIS, Abu Bakr al-Baghdadi. 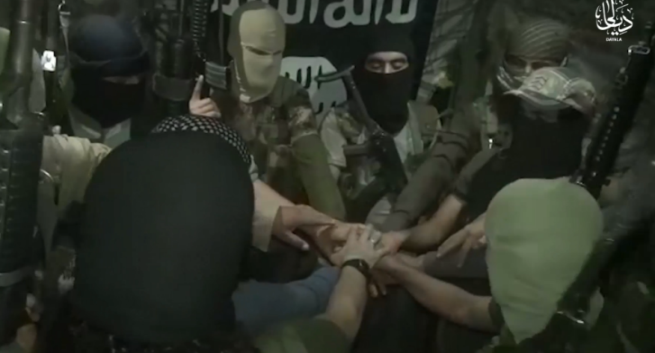 The operatives announced that they had joined ISIS’s Islamic State in the framework of the provinces of Dagestan, Chechnya and Ingushetia, and the United Vilayat of KBK (consisting of Kabarda,Balkaria and Karachai) (YouTube, June 21, 2015). The publication of a tape documenting the pledge of allegiance may indicate that some regions in the Caucasus have met the criteria of ISIS for turning them into provinces of the Islamic State, and that ISIS has begun to establish its presence in these regions. ISIS’s provinces in the Caucasus are apparently based on local jihadi operatives and possibly also on operatives who returned from Syria and Iraq. Some two months ago, the Russian authorities expressed concern about Muslim residents of the Northern Caucasus joining jihadi groups in Syria and Iraq. General Sergei Smirnov, deputy head of the Russian intelligence agency FSS, estimated in April 2015 that some 1,700 Russian nationals had joined jihadi groups in order to fight in Syria and Iraq (www.aina.org, April 11, 2015). 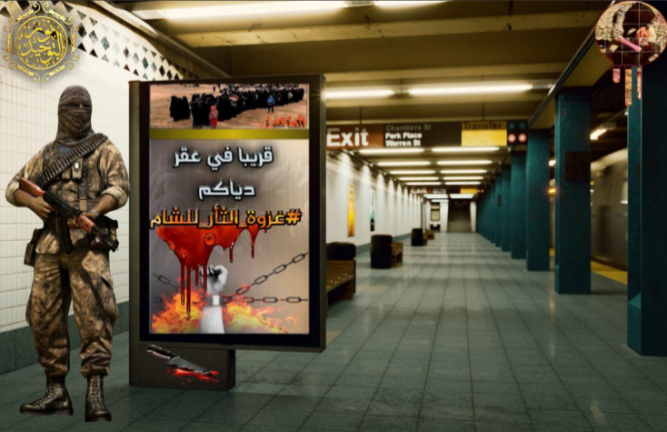 On June 17, 2015, ISIS published a video in Arabic with English subtitles, threatening the United States and Europe with electronic warfare through the Internet. According to the speaker, whose voice was distorted and whose face was hidden, ISIS’s electronic warfare against the United States and Europe has not really begun yet, and what has been done so far is just a prelude to what is expected in the future. He claims that up to now, ISIS’s hackers have broken into a number of sites, after billions of dollars were spent on making them secure. This was done easily and quickly and enabled ISIS to obtain important security information. The speaker addresses the West, noting that Islamic hackers will be the “electronic army” that will conduct the electronic warfare and will assist the fighters on the ground (YouTube, June 17, 2015). The annual terrorism report for 2014, issued by the US Department of State, emphasized the spread of ISIS, its ability to recruit foreign fighters and its ability to influence “lone wolves” [for the purpose of terror attacks]. All this, according to the report, helped ISIS supplant Al-Qaeda as the world’s leading global terror organization. According to the report, the number of foreign fighters who have gone to Syria is over 16,000, from over 90 countries, and many of them join the ranks of ISIS. The report noted that ISIS has demonstrated its ability to use every type of online social media to call on a wide range of potential sympathizers around the world, including English-speaking audiences (website of the US Department of State, June 20, 2015). According to a BBC report, police teams have been set up throughout Europe to monitor and block ISIS-affiliated accounts on social networks. The teams will begin working on July 1, 2015. A recent study conducted in the US found that there are at least 46,000 Twitter accounts affiliated with “militant groups,” many of which help recruit new operatives into the ranks of ISIS. Researchers from Brookings Institute in Washington estimate the number of ISIS-affiliated Twitter accounts at over 90,000. The European police agency (Europol) works with social media companies to monitor these accounts. The goal is to close down such accounts within two hours from the moment they are opened. Europol estimates that at least 5,000 European citizens, including citizens from Britain, France, Belgium and the Netherlands, have traveled to areas controlled by ISIS (BBC, June 22, 2015). ISIS attaches great importance to the battle for hearts and minds, and invests considerable resources in this area (skilled personnel, large sums of money). ISIS has a highly effective propaganda system that produces a large amount of media products. It is run by Iraqi and Syrian professionals, who work together with Arab and Western professionals. ISIS perceives the Internet, and social networks in particular, as the primary means for spreading its ideology and political messages in the West and in the Arab/Moslem world, and as an important tool for recruiting foreign fighters, for fundraising and for communication between its operatives.Effectively monitoring and blocking ISIS-affiliated accounts on social networks may disrupt ISIS’s propaganda system. Tweets on Twitter and videos uploaded to YouTube by ISIS operatives in Syria and Iraq have enabled researchers to monitor their movements in Iraq and Syria. The data was collected by researchers from IHS Conflict Monitor. According to the study, ISIS is directing most of its attention to weakening the Syrian regime and is paying the price in the form of losing territory to the Kurds in northern Syria. Data collected between March and May 2015 indicates tactical decisions by ISIS not to attack the Kurdish forces on the northern front, which would expose the ISIS operatives to US and coalition airstrikes (technology.inquire.net, June 21, 2015). Five Thai college students were detained in Pakistan after trying to smuggle a handgun, bullets and propaganda materials on a flight to Thailand. The five are suspected of having ties with local rebels and with ISIS. At least two of them were trained by ISIS operatives or had ties with ISIS operatives. According to the Prime Minister of Singapore, Southeast Asia is a center for recruiting operatives for ISIS. He said at least 500 Indonesians and dozens of Malaysians had been recruited by ISIS (Bangkok Post, June 12, 2015).